In Ridley Scott's excellent survival thriller, astronaut Matt Damon is stranded on the surface of Mars and must use anything and everything he can find and salvage to survive. His sleek spacesuit was once such life saver - but could we recreate it in real life? Turns out NASA is currently working on its Z-2 and Prototype eXploration suits and both are deep in the developmental stage as it tests out different materials and designs. Such designs would be a huge step over the clunky suits astronauts have been wearing for the past half century. In Bong Joon-Ho's dark sci-fi adaptation, The Rattling Ark is a giant luxury (and, not so luxury) locomotive that holds the last vestiges of humanity within its carriages. Its dystopian rail service zooms around the globe in a giant loop as the world outside is gripped by a man-made ice age. Interestingly, engineers in Japan have designed a real-life giant, luxury train. Japan's JR East railway firm have contructed the $15 million 'Cruise Train', complete with luxury bedrooms (some with two floors), restaurant style dining carriages and a glass observation deck. 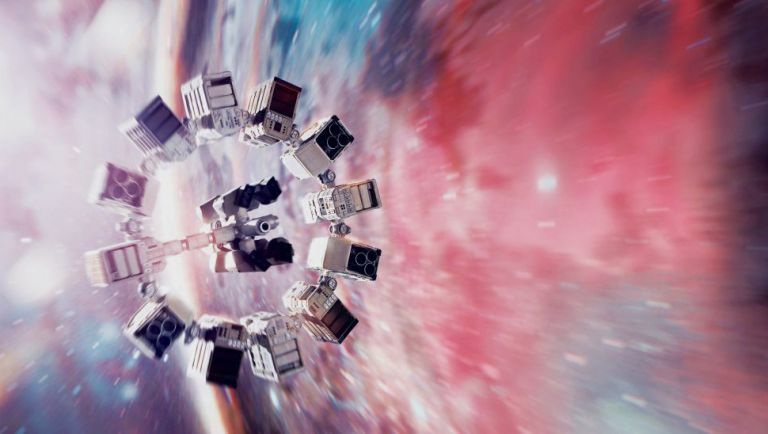 While Nolan's post-Batman foray into space travel may be bound to the realms of science fiction, the technology that took McConaughey and co into deep space does have some roots in reality. NASA isn't pursuing interstellar travel at the moment, but the space agency is using something known as ion propulsion to power its deep space craft. Such a means of power is the most efficient one created to date and currently fuels the Dawn craft, which is studying the distant dwarf planet Ceres. Instantly as iconic as the classic '60s Batmobile or Tim Burton's 1989 take, the Tumbler wasn't just for show - it was a fully-functioning vehicle. Better yet, it was completely unique in design and wasn't just a Hummer with a plastic chassis. Considering it could hit speeds of over 100mph and had a suspension that moved inwards rather than outwards, enabling it to withstand jumps of up to 60 feet it was no mere prop. Even the Tumbler's rocket booster was real - using propane tanks to create a fiery tail of propulsion. Generic as its title was, EoT had some nifty bits of tech - most notably the battle suits that increased a soldier's speed and strength and enabled them to wage war with some serious weaponry. But could such a suit really work in real-life with all those pesky laws of physics floating around? Currently in a working prototype stage at American defence contractor Raytheon, an exosuit has been built with 'load-bearing' in mind rather than combat. If rolled out, it could enable soldiers to carry incredibly heavy amounts of equipment into the field with ease. Ex Machina isn't the first film to feature AI combined with the guise of android robotics, but are we any closer to a real life sentient intelligence? Well, yes and no. On the robotics front, new builds such as Boston Dynamics' Atlas robot can stabalise itself if walking on uneven ground, but struggles to emulate true human movement. In terms of AI software, Ex Machinas use of a fictional search engine as the basis for an articial lifeform that can learn and adapt has been the basis for popular scientific theory for years. Complex AIs do exist in everything from videogames to production lines, but we've still some progress to make before we reach sentient AIs. It might be a little long in the tooth now, but the technology used in Cruise's pre-cognitive trip still feels iconic. Alongside those holographic/augmented gloves, the sonic shotgun was an instantly memorable addition to its filmic canon. Ultrasonic weapons (USW) are a real thing too, but not in the slimmed down version we see in Minority Report. Sonic weapons are in use by the police and military as anti-riot tools but we're quite some way off the sleek, swinging shottys on the big screen. The Indominus Rex may have been the infamous top attraction of Colin Trevorrow's money-printing revival of the Jurassic Park franchise, but those glass gyrospheres were the real stars of the show. During production, the gyrospheres were a proper practical effect that used hidden metal tracks and ball bearings to make them run. Combine such a track with the success of the tech behind the Sphero (which brought you that remote control BB-8) and a larger gyro could well be possible. Okay, we've not gone mad after all that Star Wars coverage had up on the site last Christmas - we genuinely think that self-raising loaf Rey makes in The Force Awakens is one of the best bits of tech in the whole film. It was a practical effect, too (a fake piece of bread was deflated and pumped up with air to make it rise), but could dehydrated bread powder really work? Baking pro Jenn Fujikawa has created a recipe that uses matcha (a ground powder used in green tea) to create an instant loaf in a mug. Remember the electromagnetic gloves used to scale the 829.8m Burj Khalifa skyscraper in Ghost Protocol? Well, the production team used harnesses and wires to keep Mr Cruise from falling to his doom, but could such a glove or suit ever really work outside of fiction? I, Robot might have been a tad dull, but it did pull off one or two original ideas. One such saving grace involved a self-driving car that was assaulted by a slew of ill-minded robots. The Audi RSQ is a real concept car too (similar to the Lexus 2054 that appeared in Minority Report). Self-driving cars are slowly edging towards reality with firms such as Google and Ford investing millions in the concept. Sure, some of them end up crashing into the back of buses, but the creation of spherical tires proves car engineers are firmly focused on an autonomous automotive future.